Andrew Atroshenko's - "Thoughts Before the Dance"
Fabian Perez's - "Tablado Flamenco IV"
Michael and Inessa Garmash's - "Garden Treasures"
Michael and Inessa Garmash's - "Ready for Romance"
Oleg Zhivetin - "Cubist Dream"
Oleg Zhivetin - "Happy Family"
Oleg Zhivetin - "Silent Talk"
Pino's - "A Time to Remember"
A TIME TO REMEMBER by Pino. 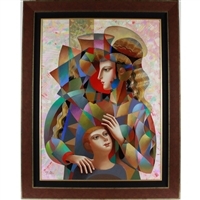 Medium: GICLEE ON CANVAS Image Size: 30 x 36 Framed Size: 40 x 46 Edition Size: 89/295. Another heart-warming, family moment by Pino. Elegantly framed in the Larson-Juhl Prague line with Flax Oyster Liner. Just beautiful! Limited Edition, Hand Signed and Numbered Giclee on Canvas entitled A Time to Remember by Pino (Daeni). Hand Signed from an edition size of 295. 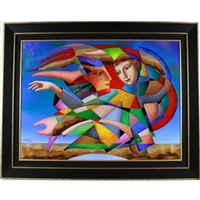 Your Pino art will come elegantly framed and ready to hang. 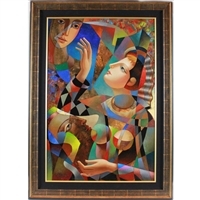 The artwork and frame are in mint condition and comes with a Gallery Certificate of Authenticity. 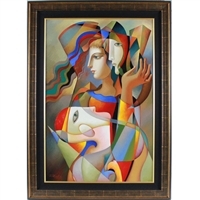 Pino's - "Dancing in Barcelona "
Pino's - "Moments of Affection"
Pino's - "Pino - Timeless Visions - Fine Art Book"
Sergey Ignatenko's - "Girl Reading"
Sergey Ignatenko's - "Scent of a Woman "
Firerock Fine Art is dedicated to bringing you the finest in fine art.